Ruach HaShem Gordon from Shilo takes male youth Muaythai competition although shorter and lighter than opponent. Ruach HaShem Gordon (14) of Shilo in Samaria clinched the male youth 14-15 category in 40kg at the 1/4 semi-final against a Sri Lankan opponent with a final score 30-28, although weighing less than 40kg and being shorter than his opponent. The third round was particularly difficult, but Gordon pulled through and will go on to represent Israel in the next semi-final tomorrow. He will face his Ukrainian opponent for the second time after losing to him at the European Cup in Antalya Turkey in 2017 at the semi-final with a close score 28-29. At that time, Ruach fought in the 42kg category although his Ukrainian opponent weighs 4kg more. This will be Ruach's second time at the Youth World Championship. Ruach is from a family of Thai boxers. 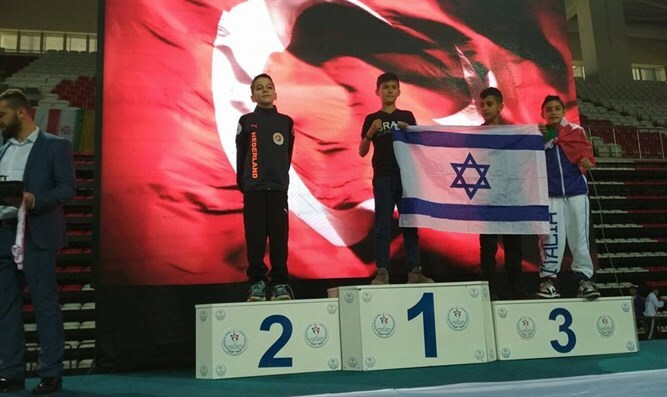 He won his first professional fight last year in Koh Samui Thailand, while his little brother Ahavat HaShem (12) was gold medalist at the European Cup 2017. They both are part of the Israel national Muaythai team, and both are currently representing Israel at the IFMA Youth World Muaythai Championships 2018 in Bangkok. Ahavat Gordon also put on an outstanding performance at the IFMA competition against his Moldovan opponent yet losing with a final score of 28-29. This was his first time at the youth world championship and his family says he'll be training to return. Their older brother Kibedy Gordon (18) was Israel Youth Muaythai Champion and Israel Muaythai Champion in the adult division in 2018 and was European Muaythai Champion in 2017. He also won his first professional fight in Thailand last year. He will be serving in the IDF as an outstanding athlete in the coming days. Muay Thai or Thai boxing is a combat sport of Thailand that uses stand-up striking along with various clinching techniques. The discipline is known as the "Art of Eight Limbs" because it is characterized by the combined use of fists, elbows, knees, and shins.